» DCI Brings Adaptive Signal Control to Washington, D.C.
DCI Brings Adaptive Signal Control to Washington, D.C. In much of the U.S. and most of the world, traffic signals are set to fixed cycle lengths, regardless of traffic patterns. In Washington, D.C., the current traffic signal system has limited ability to react to changing conditions, which vary wildly from the morning commute into the city, road use during the workday and then the evening commute out of the city. Anyone who lives in the Washington Metropolitan Region will tell you it is the definition of a traffic nightmare. DCI is working to change that with the lead role in the District Department of Transportation’s (DDOT) Adaptive Signal Control System (ASCS) Pilot Project. 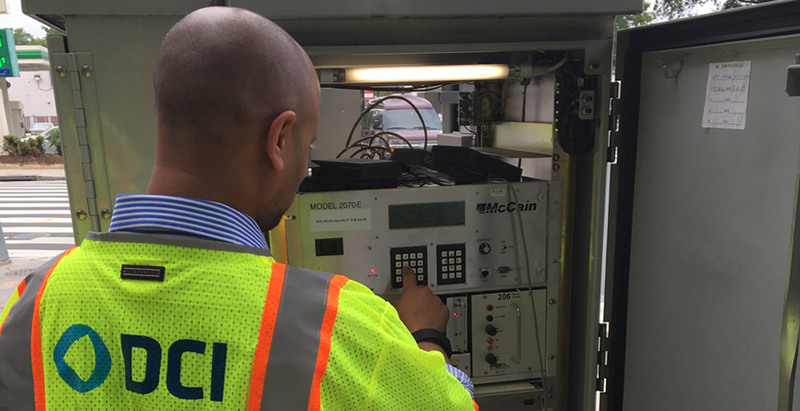 The goal was to integrate adaptive traffic signal control with DDOT’s existing traffic signal control infrastructure, and then to evaluate the benefits of an ASCS deployment. The scope of DCI’s work included procurement and installation of software to upgrade the District’s current central traffic management system (called QuicNet) with an adaptive control module (called QuicTrac) to enable adaptive signal control. In this pilot program, ASCS technology adjusts signal control parameters, including cycle length, split, and offset, to real time-traffic conditions and allows traffic to move more efficiently along three major corridors: Rhode Island Avenue, Pennsylvania Avenue and New York Avenue. Congestion and travel times for motorists using these corridors will decrease, and there are safety and environmental benefits as well. With fewer stops for vehicles, the likelihood of traffic crashes will be reduced. Rubbernecking, idling time, emissions and fuel consumption will be reduced as well. To date, DCI has successfully rolled out the hardware and software with the desired adaptive signal control functionality in line with DDOT’s requirements. More than 55 signalized intersections along the three corridors have been upgraded from 170E to 2070E controllers, including new communication modems and video detection systems. DCI also assisted DDOT in testing and validating operations involving the upgraded central management system and the related video detection systems installed along the three corridors. DCI is looking forward to contributing to the future expansion and success of the adaptive signal control system in the District.